Happy Monday! warning: this post is random and all over the place. A lot is goin’ down between today and two weeks from now. I’m charging after everything at work and on my to-do list. And let me tell ya, the list ain’t short. I’m focused and ready to put in the hours at work to get ‘er done. Guys, this past weekend was pure joy. From going out to see Les Mis (incredible. ), to spending a few extra hours in lab, to decorating our dining room, to clocking in a long run, the whole weekend was productive. And that makes me feel good. 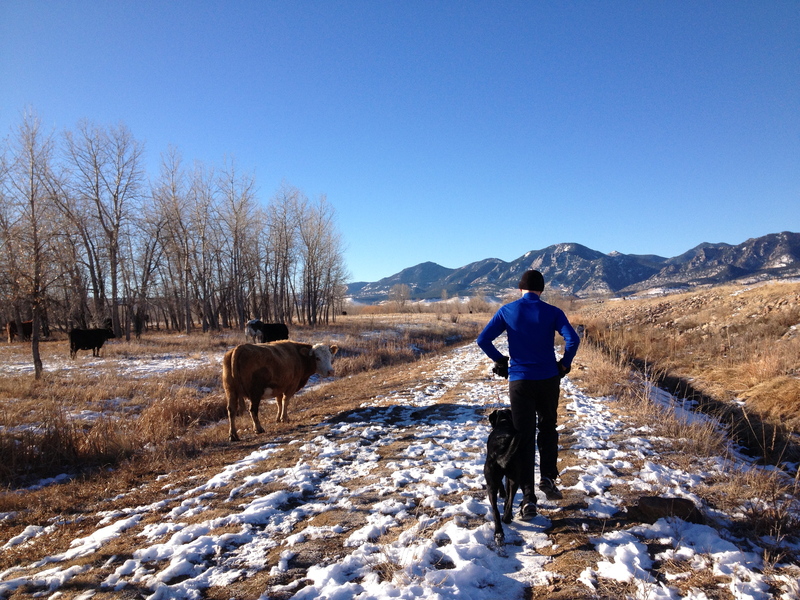 Random #1: We went for a light, easy run on Saturday with Cabo. She had a curious, and quite close, encounter with a cow. Cabo’s used to being the bigdog on campus, so I think she was a little timid when she ran by such a large creature. Note: Cabo was on leash for this part of the trail run. Random #2: On Sunday, Weez and I ran 12 as our ‘back down’ long run and to say it was tough would be an understatement. For some reason, we decided it’d be fun to climb 1100ft of elevation gain in the first 6 miles while running on crunchy, uneven snow packed trails. Sure my legs felt like junk by mile 7, but tough runs make for tougher runners. It was a good, hard run. Random #4: Weez and I are also steadily reading through Stephen King’s The Stand. Also, very great book. I highly recommend it. The characters migrate to Boulder, CO which makes the storyline feel all the more relatable. I’m really loving it. Have you seen Les Mis or read either of the above books before? Currently have “The Beautiful Forevers: life in the Mumbai Slums”, “Last man in the Tower” (indian author, and Vogue India…I’m definitely on an Indian author kick. Also where are pictures of the dining room!? I’m in the process of writing a review blog post for Les Mis. Absolutely fantastic. 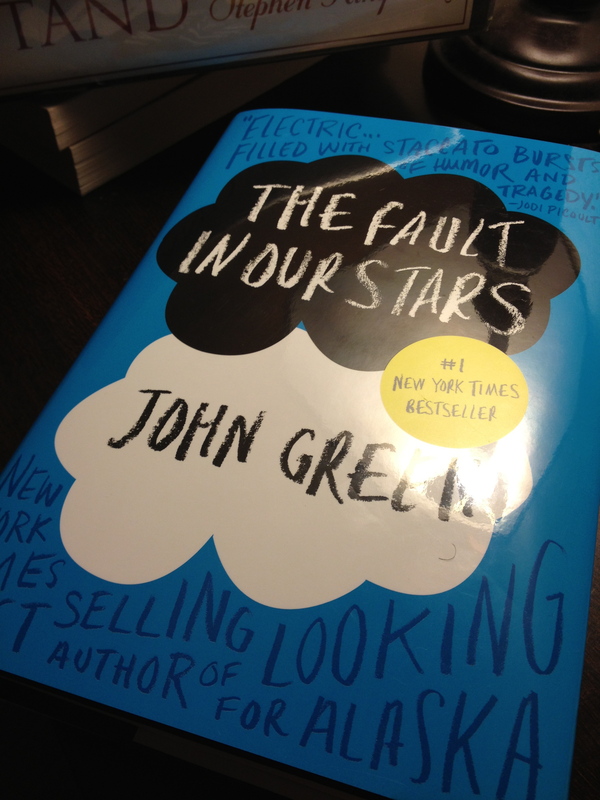 I keep hearing about this book so I guess it’s time I put it on my list! My recent great read was Light Between the Oceans–awesome! Just finished a good read “Defending Jacob”. Like your reference to events happening in CO, the events of Defending Jacob happen in the Boston area, so I agree that it’s cool. Isn’t it so great that, sans the cow scenario, when you can run Cabo off lead? It’s so great to see them running free without being able to get into trouble!